And if not, why not? After all, there were plenty of data, details and PowerPoint slides. Why does the essence seem to fade so quickly? What’s missing here? 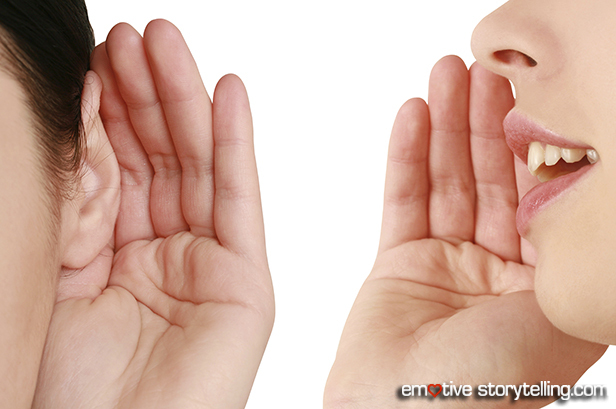 A learned skill called “Inspired Listening.” Inspired listening fosters rapport, comprehension and real communication. It can transform a debate into a shared story or appreciation for each other’s story. No matter what, you can use it to make your own story even more persuasive. The first step is to simply listen. That means listen quietly and focused. That alone is toughest part. Only then can you move on to the second step: repeat what the speaker says. Confirm her words. Say something like, “let me see if I got that. You said, ‘I believe that the situation should be….’” Quote her verbatim, and let her confirm that you heard her correctly (or let her correct you.) This is extremely validating and affirming. And take note, her story is likely to contain not only facts, but an overlay of opinion and emotion (good stories usually do!). Inspired listening will let you differentiate one from the other, and give you the clues you need to tell your own story more effectively when it’s your turn to speak. If there’s a point of contention or difference, consider responding with a story. Here’s why. Most often it’s a battle of facts that get people to tangle. Instead, tell a story. Narrative communication (in other words, a good story,) radically alters the way information affects a people. Research has shown that when people are transported into a story they suspend disbelief and stop arguing against the message. This is a truth that you should test in your own relationships. Generally speaking, stories don’t challenge or threaten people. If anything, it’s quite the opposite, they open the possibility to understanding and empathy. As for your story… whether it’s a 30-second “elevator pitch” or an interesting anecdote, try to incorporate her thoughts and words as you speak. And make sure it’s a meaningful story, whether it’s literal or metaphorical. The object is not to argue, but to invite perspective and persuade. And again, remember this pearl of wisdom: as a rule, people don’t argue with stories. Of course, if you’re addressing a crowd of friends, clients or strangers, you may not have the luxury of a long heart-to-heart narrative with each of them. But if you use the tools of inspired listening and good storytelling, even brief interactions will be taken to heart. That’s an exchange that people will value and remember.